This compressor control upgrade project for a polymerization plant operated by Safripol (Pty) Ltd. in Sasolburg, South Africa, is a showcase of Safripol and Yokogawa's integrated control philosophy. Here, a single control room concept was followed in the integration of an existing Yokogawa DCS (CENTUM CS) for core process control with a fast STARDOM Network-based Control System (NCS) for high-speed compressor control. According to Mike Dukas, a process control engineer at this plant, "Making use of Yokogawa's different control platforms having unique specifications but the same well known 'look and feel' operator interfaces allows us to avoid extensive operator training, yet provides both the right control philosophy on the plant floor and makes use of the existing management information software tools." A reduced OPEX for the compressor operation by replacing old and obsolete PLCs with a modern hybrid control platform. We felt STARDOM met all of the above criteria- and the decision was then taken to purchase and install the first STARDOM network-based controller in South Africa." The project was initiated to replace the existing PLCs with new technology that will be able to communicate with the Yokogawa CENTUM CS DCS via Ethernet. A total of four package units will be converted over the next few years. The first and second units, PK301 and PK401, are already in operation. The third unit, PK601, will be installed during a scheduled shutdown in March 2007. All units will communicate via a Yokogawa gateway unit to the DCS. One of the objectives of Safripol was to avoid operator interference as much as possible in order to reduce costs and guarantee that processing could continue undisturbed after switchover. 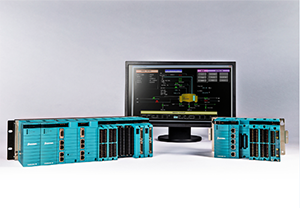 By making use of a STARDOM hybrid controller, a single 'look and feel' operator interface could be established, enabling the continued use of the DCS software and hardware while maintaining the PLCs' high-speed process response. The second challenge faced was the criticality of the compressors in the process. Stopping the compressors meant losing money. A tight changeover schedule and accurate pre-testing was essential. "The changeover was virtually bumpless. Besides the planned mini-shutdown time, we did not experience any additional downtime. The first controller has been running now for over a year without any problems," Mr. Dukas explained. "The first STARDOM unit was installed with the help of Yokogawa South Africa and, due to time pressure, this was done without official training. Programming the controller was done with remote assistance from Yokogawa SCE in the Netherlands and Japan. The changeover took place without any failures or plant delays and was well within the planned time and budgets. More units will be placed during the course of 2006, eventually replacing all existing compressor control systems with Yokogawa's STARDOM." The third objective was to make sure the new compressor control system was easy to program and maintain. This allows future expansions and modifications as well as the installation of additional units. According to Bennie Coetzer, a process control engineer at the polymerization plant, "Even without training on the system, it is simple to find your way and start with the first steps of programming. After a 3 day training course one really feels the power and flexibility of the STARDOM system. Working with Yokogawa equipment gives me great satisfaction, because I know that if I need a solution, it only takes a phone call and the response is immediate." Mr. Ducas: "The old saying still applies, you cannot control what you cannot measure. But to get all these signals to and from the DCS using old technology, cabling, and junction boxes costs a lot of money. We decided to keep costs down by using modern technology that met all our requirements. A lot of options and product combinations were evaluated and STARDOM with Ethernet communication came out to be the best for our business." Safripol (Pty) Ltd. offers an extensive line of traditional polypropylene resins to a wide variety of markets including automobiles, consumer durables, rigid and flexible packaging, health and hygiene, compounding, and fibers. Safripol's resins deliver an optimal balance of price and performance, while covering a wide range of product applications in the areas of film, injection and blow molding, sheet extrusion, and thermoforming. Safripol's resin line includes homopolymers for stiffness, impact copolymers offering impact resistance over a wide range of temperatures, and random copolymers for clarity and sealability. Safripol's polypropylene resins offer consistent processability, high heat resistance, good clarity and gloss, low water absorption, high stiffness/hardness, excellent moisture barrier and chemical resistance, enhanced mold filling and releasability, and excellent fatigue resistance.